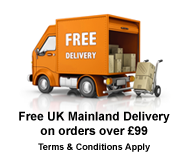 We offer next working day delivery on our scanners, projectors, software and shredders as long as we have the item you ordered in stock and you reside in the UK mainland. If you want to enquire regarding stock please contact us. For larger items delivery may take slightly longer and we will inform you of this. We are unable to give a delivery time from the couriers as they will deliver between normal office hours. 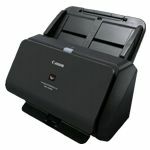 ADF stands for Automatic Document Feeder, A tray for automatically feeding a stack of documents into document scanners. Generally unavailable in large format scanners. What does simplex & duplex mean? Simplex is the process of scanning one side of a document as it passes through a document scanner, Duplex is the process of scanning both sides of a document as it passes through a document scanner. If you have seen a product listed elsewhere cheaper than we are selling it for, we will beat our competitors prices on all products guaranteed! Can I pay for an item by invoice? Yes you can, simply give us a phone call and we will set your company up with an account which will be needed to be paid in full within 30 days. Can I hire a document scanner? 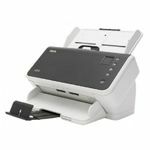 We have our own document scanner hire company where you can hire a range of scanners to suit your needs with a minimum rental period of just one month. You can also hire a network device to share your hired scanner with more than one computer in your office or company. 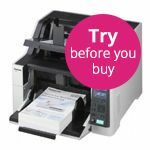 All of our document scanners come with a minimum 1 years on-site manufacturers parts and labour warranty. Can I use your document scanners on a network? 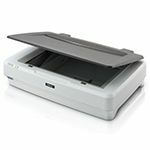 Our document scanners that are compatible for use on networks are stated in the description of that scanner, most of our document scanners can be networked using a third party device called a Silex Server, this has to be purchased seperately and allows sharing of a scanner across many PC's. For full compatibility please contact us for more information. If your question has not been answered here or you have a comment to make please contact us 0800 043 9972 and we will endeavour to help you.